Very high quality box sets of Christmas cards by artists of the Royal Academy. NEW Designs Added for Christmas 2018. New range of Christmas cards sourced from the extensive collections at the British Library, featuring a range of classic seasonal imagery. Cello packs contain 8 cards of 1 design with envelopes / 5 cards of 1 design with envelopes. NEW Designs for Christmas 2018. From a boutique range of contemporary illustrators and print-makers, printed on our textured art board. Set of 5 Gift Tags of the same design - 85 x 45mm printed on beautiful uncoated board with rustic twisted string for attaching to your present. Very high quality box sets of 24 cards (4 designs) cards by artists of the Royal Academy. The countdown to Christmas - fun Advent Calendars including the NEW 'We Three Hares' by Angela Harding. Open and remove the windows to complete the picture. Supplied with large envelope to send to friends and family. Packs of 5 quality fun Christmas cards by artists published by Art Press. High quality fun Christmas card singles by artists published by Art Press. 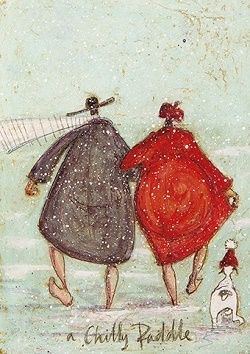 Christmas Card Packs and Christmas Card Singles by the artist Sam Toft. Packs of 6 cards with red envelopes by Scottish artists. Fine art blank cards, perfect for Chistmas but great for all occasions. Beautiful Pop and Slot Advent Calendars and Christmas Pop and Slot deocorations. plus 3 special lasercut cards to choose from. 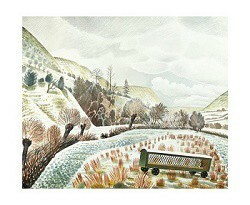 A beautiful selection of fine art Winter/Christmas printmakers and twentieth century artist cards. NEW designs for Winter 2018/2019. Highest quality blank cards, perfect for Christmas but great for all occasions. High quality single blank cards, notelets and Advent Calendar available. High quality single blank cards, winter wreath decoration card and 2019 Calendar available. High quality single blank cards, folding collage cards and Christmas packs available. High quality single blank printmakers cards, Winter/Christmas notelets and 2018 Calendar. High quality single blank cards and notelets available. A selection of Christmas packs by Royal Academy artist Richard Spare. A selection of Royal Academy Christmas wallets by artist Brian Wildsmith. A selection of Christmas packs by Royal Academy artist Mary Fedden. A selection of Christmas packs by artist Vanessa Bowman, published by Canns Down Press.